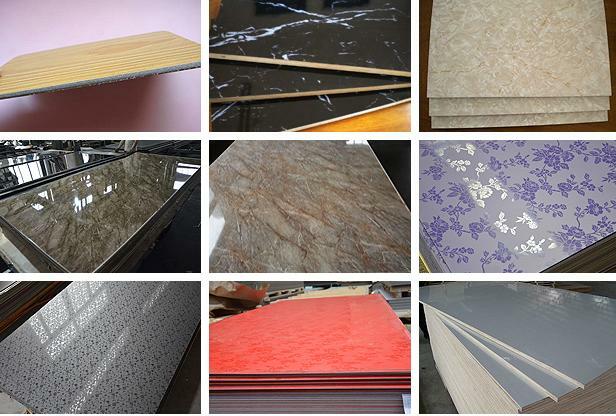 HPL is the acronym of high pressure laminate. It is considered to be one of the most durable decorative surface materials and is available with special performance properties including chemical, fire and wear resistance. It is produced by saturating multiple layers of Kraft paper with phenol resin. Because phenol and melamine resins are thermo set plastics, the curing process transforms the resin into plastic by a cross linking process that converts the paper sheets into a single, rigid laminated sheet.Thermosetting creates strong, irreversible bonds that contribute to HPL’s durability. HPL is laminated to a panel utilizing a variety of adhesives. Particleboard, MDF, Hardboard or even plywood are the preferred substrate because they provide a stable, durable, consistent and economical foundation. Due to its durability, our HPL is a common choice for horizontal surfaces including flooring, counter tops and desktops. It also performs well in horizontal and vertical applications for high traffic settings such as hospitality, office furniture,healthcare, retail casework, commercial interiors and educational facilities.